Today is the last day of 2012 - where has the time gone? I'm still trying to figure out where 2011 went. It's also the last couple days of my vacation - so what a better way to spend it than to make some cards. This card was made for the 'ABC' Challenge- New Year Sparkle!. The challenge is for a card that sparkles in some way and since I love to always add a spot of bling to a card I figured it would be a good time to jump right in. One of the things I wanted to do with this blog was to participate in some challenges. 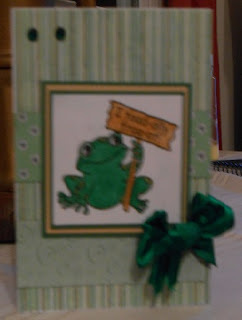 I thought it would help me in my card making skills and also get me out of my comfort zone. Seems like I can't make a card unless it has some ribbon and bling on it somewhere. So for my first card - yep, ribbon and bling. Ah, some things will never change. The challenge is at The Sweet Shop (Sweet 'N Sassy Stamps) and is SSS119. I love this little frog....what a cute guy. It's been so nice being on vacation this week. It has allowed me to spend some time in my craft room! This card was made using a card kit. I've been in this great swap over at SCS for monthly card kits. And December the person is ME! So my mailbox has been seeing some great card kits arrived. I thought the image was so sweet and loved the colors. It's funny cause orange shades really were never anything I liked to use - but last year I discovered using orange in another swap and have become quite fond of orange and peach colors. It's hard to believe that I'm starting a blog. I never thought I would do this....but here I am. I can't even say what this blog will be yet...part crafting and part rambling on about life in general I guess. Hopefully as time goes by I will learn more about how to do this successfully and it will be interesting. For now I just used a blog template and here I am. So I guess a little about me - First and foremost I am a Christian and my love for Him is what centers my life. Next would be the love of my life - Russ. I can't say enough about how wonderful he is...he's my best friend and I can't image life without him. We have 3 children and granddaughters. We are truly blessed. I hope you enjoy this journey with me. Here we go into 2013. It's a New Year and a new blog. LOL!